My sister gave me an infinity scarf that is so soft and comfortable that I could wear it everyday. When I received an invitation for a "Favorite Things" party in the mail, an infinity scarf was the first thing that came to mind. 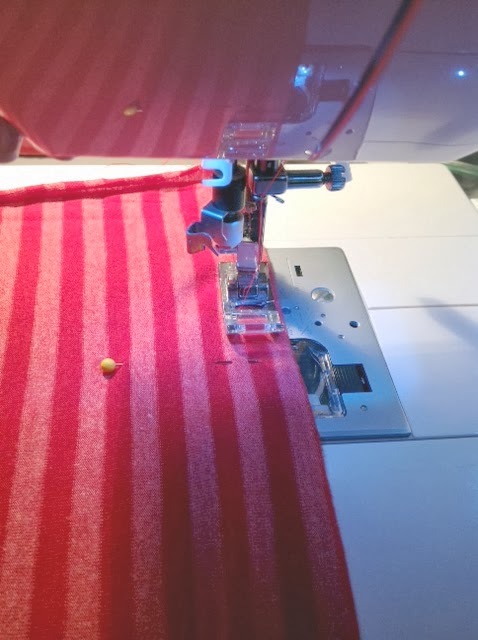 After consulting Elizabeth, I purchased 4 yards of Cherry Red Tonal Stripe Cotton Jersey Knit at Girl Charlee Fabrics, my favorite online fabric shop for knits. (Four yards of fabric produces 4 scarves, which is what I needed for the party.) 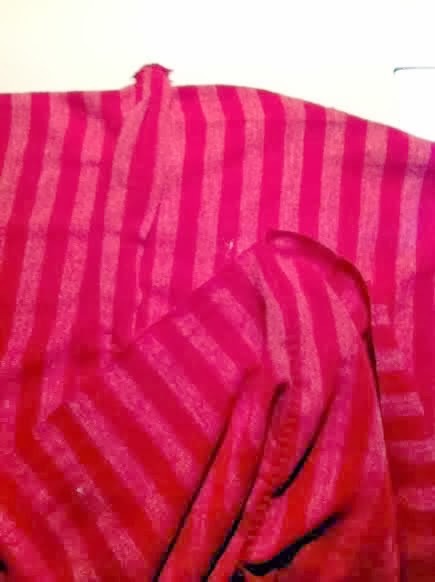 In order for this to be a 5-minute project, you must buy cotton jersey knit fabric that has a double-sided print; in this case, the stripe is woven, so it appears the same on both sides of the fabric. Otherwise, you have to take a few more steps in your scarf construction to hide the non-print side -- you can find a tutorial for that method at Sew Creative blog. 1. Fold fabric lengthwise and lay flat. Cut along the fold, producing 2 rectangles that are each 2 yards long and 30 inches wide. 2. Fold and pin the short ends together to create a tube. 3. Ensure your sewing machine is ready for knits. Use scrap fabric to sew some test seams with a zigzag stitch. Knits are troublesome -- they tend to catch, gather, and fight you. It's important to get your presser foot tension right or you'll find yourself frustrated. 4. Sew the short seam using a zigzag stitch. 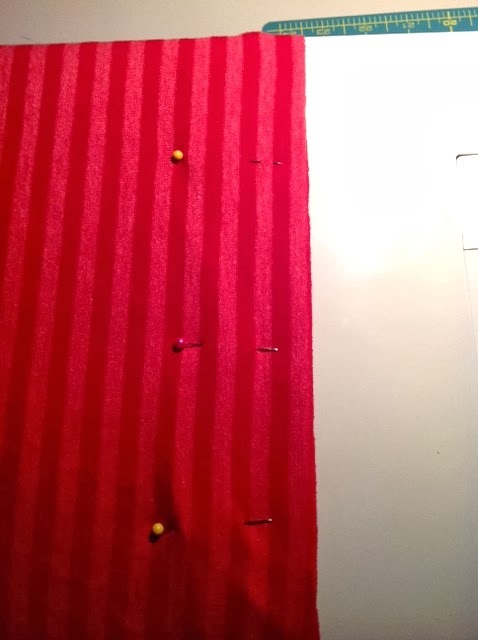 Turn and sew the seam again to ensure that the seam is secure. The seam will be hidden in the folds of the scarf, so neatness isn't critical. 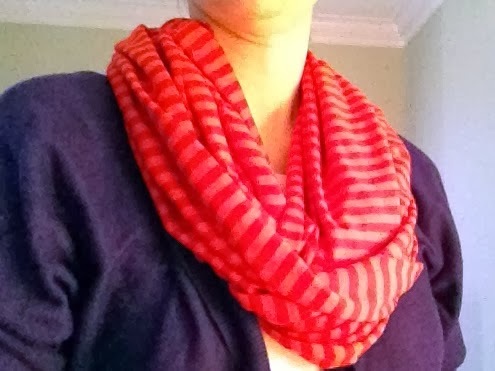 You may be asking yourself, "What about these raw edges along the long sides of the scarf?" That's the brilliance of the knit fabric. The raw edges will roll both along the edge and at the seam, and because it's knit fabric, it won't unravel. Tip: If you finish your scarf and decide to adjust the length so that it loops and lies differently when you're wearing it, simple cut off your seam, shorten the length, and resew.